This significant stylistic change, even though there aren't any earth-shattering concrete changes underneath it, turns the difficult to use standard into something that we can all use on a daily basis to construct our diet. In this post, I'll give you an intro into these guidelines and give you my thoughts on how they can be used to improve your diet. First, let's take a closer look at the plate itself. 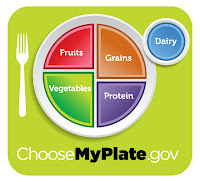 The graphic, or "icon", is a plate with relatively equal portions of fruits, vegetables, proteins, grains, and dairy. In this diagram, the relative sizes of the portions are very purposeful. The proteins and grains purposely each take up about a quarter of the plate. The other half of the plate is made up of fruits and vegetables. Notice the veggies category is just a bit bigger than the fruits. This is purposeful as well. It is worth noting that a coalition of large companies in the agriculture industry have created an in-depth marketing effort to encourage us to eat more fruits and veggies called Fruits and Veggies More Matters. Clearly, the use of the plate connects the generic icon to the way that we eat our meals. But you may not have noticed the major change to the way we are now measuring the amount of food. The food pyramid had you counting and measuring out serving sizes for each food group. That alone was probably one of the first reasons you never really put it to use in the first place. Here, we are thinking about very rough visually measure relative proportions of foods within the food groups. You could even go so far as to rearrange the food on your plate into groups (while I wouldn't suggest it for your next date night). At very least, you can imagine doing that. Over the next few meals, look at the plate in front of you and ask if the veggies and fruits take up half. Is there just as much from the protein group as there is grain? Those of you who grew up with the pyramid (or its predecessors) will be struck by how easy it is to use. Most of us can also get rid of the concept of calorie counting. I've never been a big fan of calorie counting at all. I've always hated it. I hated telling people to do it and I hated counting calories myself. Not only is it a pain, it puts the focus on how much we eat and not what we eat. The fact of the matter is that our bodies have very good hunger response mechanisms. As long as we drink enough water (some of what we perceive as hunger is actually thirst) and take enough time to eat our meals, those mechanisms do a good job of telling us how much we need. I should also use this opportunity to mention eating as a form of celebration and abundance. We tend to correlate unhealthy eating with special occasions in a way that we don't really need to -- but that is the topic for a future post. 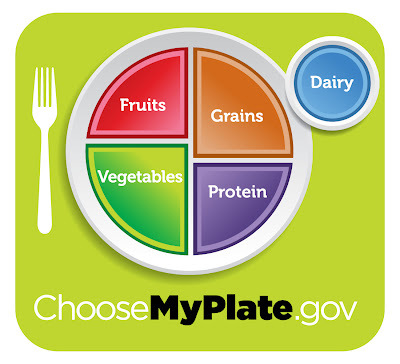 Now, some of the MyPlate supporting documents do go into calorie counting, but it isn't necessary for the majority of us. If I ruled the world, it would have been left out entirely or only presented as something to go over with a nutrition counselor. 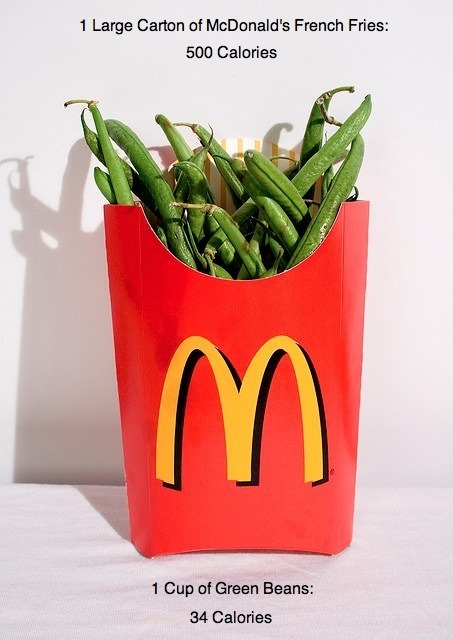 #7: Build a Healthy Meal. There are two overview tip sheets in the series with this one being the better of the two. This sheet should be your first step beyond just looking at the icon itself. 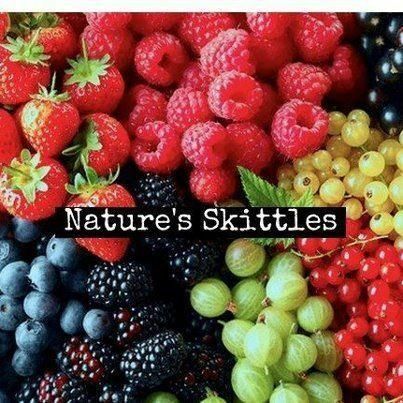 #2 and #3: Add More Vegetables to Your Day and Focus on Fruits. Just like they sound, these sheets have thoughts on getting your daily regimen of fruits and veggies. #4: Make Half Your Grains Whole. This one gives ideas about choosing quality grains to replace the highly processed starches that we tend to eat. This is a good place to note the fact that MyPlate as well as More Matters (mentioned earlier) have a lot of resources for parents and teachers to help them teach children about healthy eating. Between the two, you'll find guides for parents, posters and toys for kids, and classroom-style exercises. If you are a teacher or a parent who is concerned about nutrition, these are great resources. Left out of this so far has been the topic of meal spacing and the "6 smaller meal" approach. Eating smaller meals can help regulate blood sugar and thus keeping food cravings under control. If you are diabetic, you probably know that skipping meals or having a huge meal has an effect on blood sugar. Spreading your food out throughout the day will help keep your blood sugar steady throughout the day. Do note that there's nothing special about the number 6. Having only 4 meals that are roughly equal in size instead of skipping breakfast and skimping on lunch will bring big benefits. There's a similar argument for people who are emotional eaters or who tend to get really hungry and overeat as a result. If you have many smaller meals, your hunger will be controlled and you will end up eating less than before because you are giving your body's hunger mechanisms time to work. So, your 6 smaller meals will be even less food than overeating during 3 or fewer meals. Beyond that, the 6 smaller meal approach has been overplayed. There just isn't any evidence out there to support the claim that smaller meals make much of a difference if you have the same amount of food anyway. Early studies that implied a big difference failed to differentiate participants who reduced their overall intake from those who ate the same amount as before. Now, having breakfast is the exception. For one, having breakfast breaks the long period of time you've gone overnight without food. This is the main argument behind the 6-meal strategy -- only this time it really does make a huge difference for all of us. Healthy breakfasts -- with emphasis this time -- healthy breakfasts help fuel movement for the first half of the day and have been linked to other health benefits like lower cholesterol. From the first time I saw the new guidelines, I've been excited about them. They are the dietary answer for what I try to do for all of my clients -- to cut through the clutter out there. This cuts through the noise of calorie counting and portion measuring. With that confusion to the side, it focuses on what really matters: eating healthy foods that give you the nutrients that you need without weighing you down with all of the extra calories that you don't. And, you don't even have to think about all of that complexity. That's not to say that digging deeper doesn't have its place. A specific ailment or a food intolerance can be enough to make more detailed thinking worthwhile. But, don't jump into that unless you've tried the basics and you still aren't getting results. More often than not, the extra time spent analyzing and thinking about it only serves to discourage you. And why put yourself through that?